In my first year of serious Giant Pumpkin growing (1984) two fruit that I thought were going to be world records broke themselves off at 289 and 293 pounds in late August. 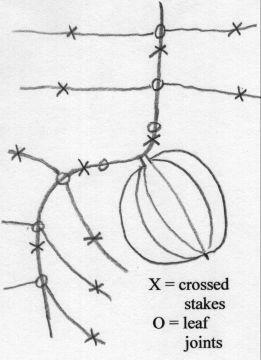 At that time information in Newsletters suggested cutting the tap roots from the pumpkin to the end of the vine to obtain slack in the runner. Another approach was to elevate the blossom end gradually with boards to tilt the stem downward. In 1985 I grew a lot of Giant pumpkins to sell and the above approaches did not seem practical. I began putting in what I called “S” curves to obtain the necessary slack. Initially some of my “S” curves were too small and I did not prune enough side runners near the fruit and adjustments were necessary. The day I pollinate a fruit I put a pair of crossed stakes 3 to 4 inches ahead of the fruit and carefully begin to curve the vine 80 to 90 degrees away from the fruit. Another pair stakes holds the vine down about 2 feet after the fruit. Snip off side runners from 1 leaf joint ahead of the fruit to 1 leaf joint after the fruit. It may be necessary to remove more side runners on the fruit side of the runner. I usually make the curve over 2 or 3 days to avoid kinking or breaking the vine. Three to 4 feet after the fruit, curve the vine back in the general direction it was headed. When the fruit is 50 to 75 pounds, clip 2 or 3 tap roots on each side of the fruit so the vine can easily rise. Sometimes the pumpkin needs to be moved a little at a time to have equal distance from the shoulders to the vine on both sides of the stem. For round fruit further adjustments usually are not necessary. Long fruit tend to push the vine backwards and may result in a kink. Watch for this and slide the fruit enough to avoid a kink. I have never supported the vine with a sling or blocks. You can do this if you are more comfortable doing so. I haven’t lost a fruit due to STEM STRESS since I began using “S” curves in 1985. I also use them on about 100 Burpee Prizewinners per year. They are necessary if you want good shaped Prizewinners. THINK BIG!!! Make the "S" curve large enough for a 5 foot wide fruit, with room to spare, and don’t leave side runners close to the fruit. You will have enough other runners. Channel the side runners near the fruit out of the fruits final area so they can root without having to be moved out of the fruits way later. Don’t cover the vine with dirt for about 2 feet ahead of the fruit to about 3 feet past the fruit. This approach may seem like a lot of work. Its not!!! After putting in a few "S" curves you will find it takes very little time. Try it if you aren’t already doing it.